Points : 8.5 out of 10. The Dutch progband Illumion was founded in 2002 by Eveline van Kampen, she called on friends of the conservatory and members of the fusiongroup Songs of the Exile. Remarkeable is the presence of plenty of ladies in the band (amongst which is Esther Ladiges who also already made a contribution top Ayreon), not evident in the world of progressive rock. The vocals of Esther immediately remind of Magenta and The Gathering, instrumentaly it leans more to the latter due to the somewhat heavier guitars. In the quiter parts you can also hear shards of Mostly Autumn or Arjen Lucassens Ambeon, not in the least by the fact that Esthers vocals are recorded in multiple layers. The songs are not particularly long, but contain enough atmosphere- and tempochanges to keep you captivated to the end. With the use of non common instruments to the genre, like erhu (2-stringed Chinese instrument), pipa (4-stringed Chinese instrument) and violin at times a special sound is created. Eveline's guitar is heavy but subtle, not one moment does she take the lead, which benefits the groups total sound. Maybe the keyboards could come a bit more upfront on the next album. For the lyrics inspiration is taken from some big writers like Edgar Allen Poe, Oscar Wilde or Charles Dickens. The band used to play covers of Pain of Salvation or Fates Warning, Eveline's original compositions sound less heavy but nevertheless lean that way. It is obvious that plenty of references can be made to collegues in the genre, still they bring a new sound. 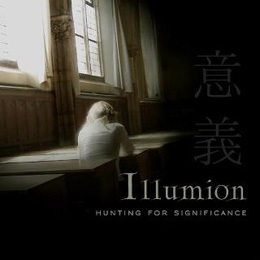 Like the title of the album suggests Illumion is, after 7 years, hunting for ackowledgement and with ":Hunting for Significance" this might well succeed. A group to watch.